It's always the same thing whenever Jaguar introduces a new model... as soon as the word is out that a new cat is about to leap out of Coventry, Jaguar enthusiasts watch anxiously to see if it is good enough to receive a leaper or growler on its bonnet. Nowadays, with Ford in charge of Jaguar's destiny the question seem to generate even more buzz and excitement... is it a Ford, a Forduar or a true Jaguar? Yes, the boot lid is higher on the X350, the lines are not as tapered as they were on the X308, the doors are taller, but the car is still the most elegant particularly when compared to the latest offerings from BMW or Lexus. The new XJ is the last design from the late and brilliant Geoff Lawson, a design finalized by Ian Callum and his team using subtle touches like the side repeaters integrated in the rubbing strip or the thin door handles placed in the thin crease. 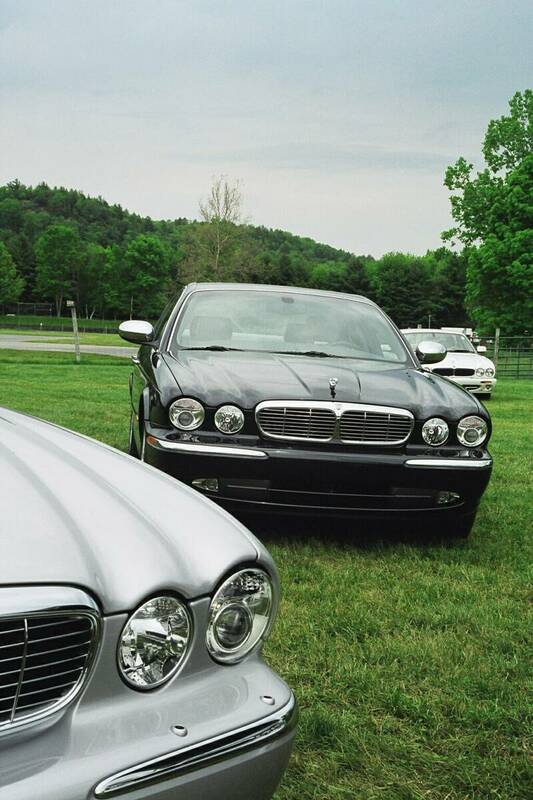 If the front end appears to look like a combination of X308 and X-Type, the grille breaks away from the previous generations and goes back to the horizontal slats design of the series 1 XJ6 unveiled in 1968. No surprises on the XJR which gets the familiar R mesh grilled and body colored surround. Shorter overhang ahead of the front wheels make the XJ more purposeful. From the back, the taller boot lid is quickly forgotten with the familiar shape of the rear light cluster. The boot lid shape is still dictated by the triangular taillights and its slightly curved shape is nicely enhanced by the name plinth (chrome on XJs, body color on XJR). Jaguar has been bragging about the all new technology it developed for the X350 construction: Aluminum Intensive using state of the art bonding and self piercing rivets adapted from the aerospace industry. 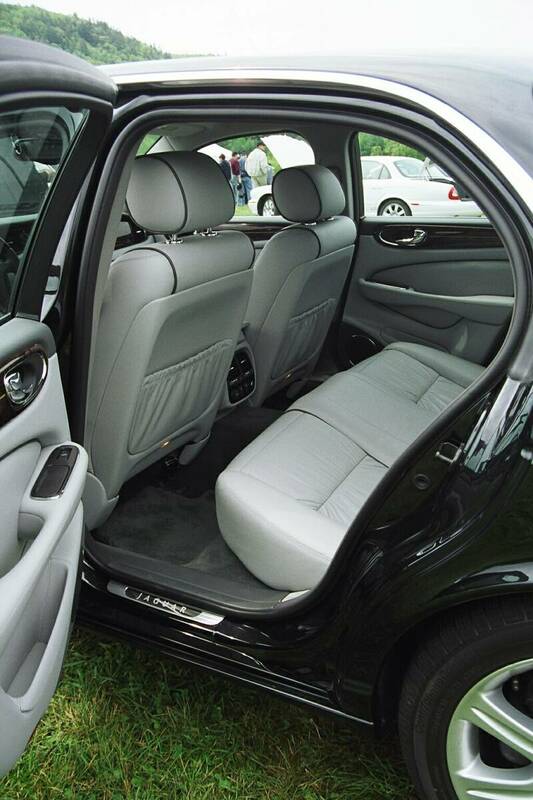 Unlike Audi, the only other manufacturer using aluminum, the X350 uses a monocoque shell. Sounds exciting? it is... the new XJ body shell is 30% lighter yet 60% stiffer than the outgoing X308 improving handling, ride quality and the overall feel of the chassis on less than perfect roads. As pioneered on the revised S-type in 2003, a magnesium cross beam in the front bulkhead and magnesium seat frames contribute to weight reduction. 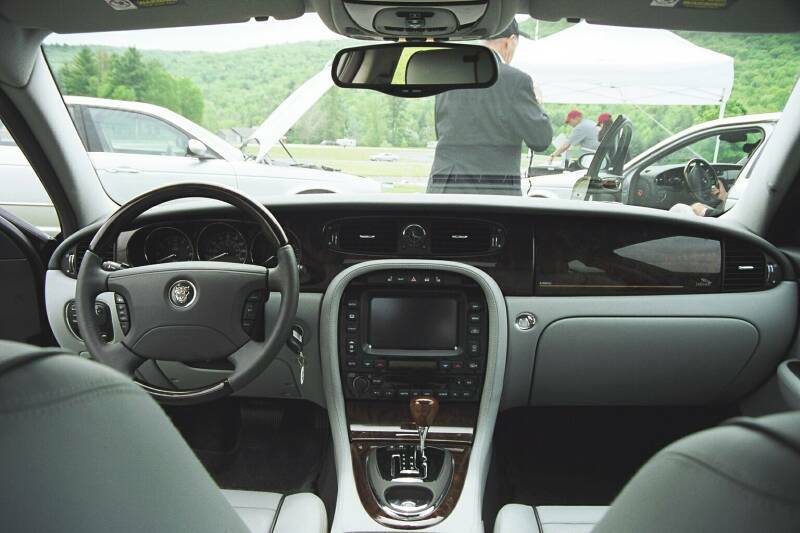 The interior layout is no surprise and owners of current Jaguars will feel right at home. A wide center console which flows up into the dash and its wide expanse of the best wood veneer work. Jaguars have always featured the best woodwork, second to none except maybe Rolls Royce and the new XJ is no exception. Gone are the controversial deeply recessed instruments which the passenger couldn't see (very handy feature if your wife think speed limits must be observed), instead they are set in a recessed pod with chrome surround around the gauges. Gone is the conventional hand brake lever, replaced by the high tech electronic parking brake introduced on the 2003 S-type operated by a small chrome gizmo behind the J-Gate, kept by Jaguar despite the (unfair) criticism it receives from most of the automotive press. I love the J-Gate for it is the only way to control the automatic gearbox while getting some direct feedback from the selected gear: the lever position tells your wrist where you are without having to look at some display as with push buttons or slapsticks. Unfortunately, adding an extra gear means the spacing on the J-gate is too small with an imprecise detent between gears. Too bad. Other interior improvements bring fixes to the flimsy cup holders used in the past (about time after 8 years) using the same slide back armrest design seen on the 2003 S-Type which doesn't interfere with he J-Gate as much. The larger glove box gets the high tech treatment with a push button soft deployment. 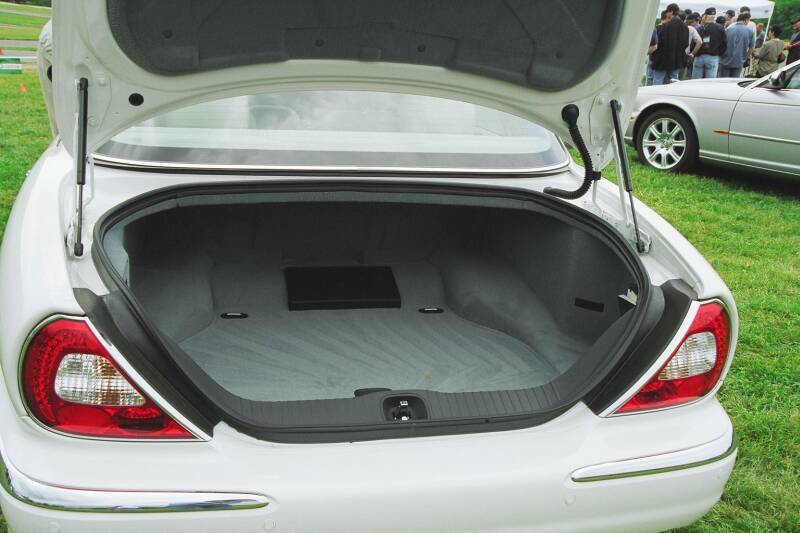 We've gone a long way since the not so distant days where the Jaguar flagship didn't even have a glove box (94 models where the only spot to install the passenger side airbag was where the glove box used to be). Enough about the styling, the comfort and the gadgets... the road is where Jaguars shine with their performance and ride quality. 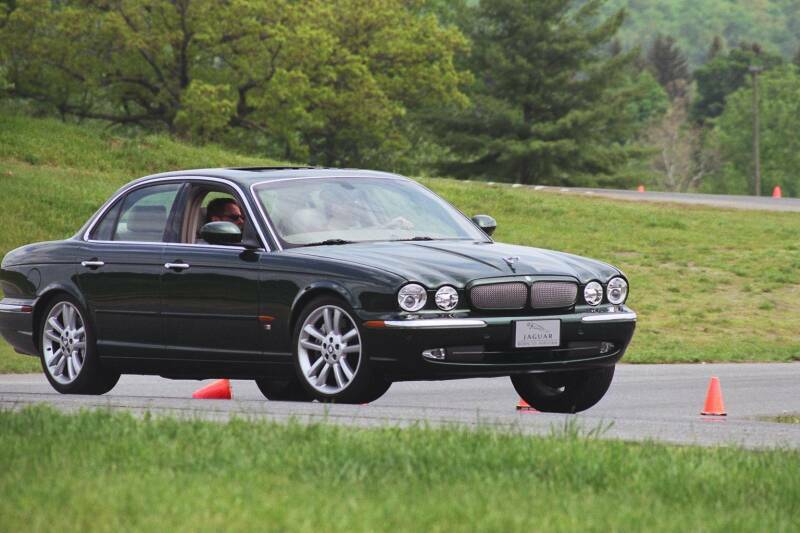 I got to test drive the XJR on the Skip Barber autocross course at Lime Rock, sort of a mini road course with cones making it a bit tighter. Road surface is smooth but there are some elevation changes and a couple of challenging spots. Perfect place to evaluate how the new XJ performs. Autocross courses are normally best left to the lightweight, short wheel base cars. Tackling them with full size luxury sedans can be challenging as they will feel heavier at low speed and much larger than they are. Well, I was in for a surprise and some eye opening laps! The power of the supercharged engine is no surprise but I can't honestly say that I could feel the 20 additional ponies (up to 390hp) brought by the larger displacement (from 4.0 to 4.2 litre). First introduced on the XK8 sports car in 1996, the 4 litre all aluminum V8 has been significantly upgraded in 2003 with numerous changes including an increase to 4.2 litre. Step on the throttle from a full stop and you are pushed back in the seat as revs climb smoothly toward the redline. The new ZF 6 speed transmission shifts just as smoothly as the previous generation Benz 5 speed used in the XJR/XKR. 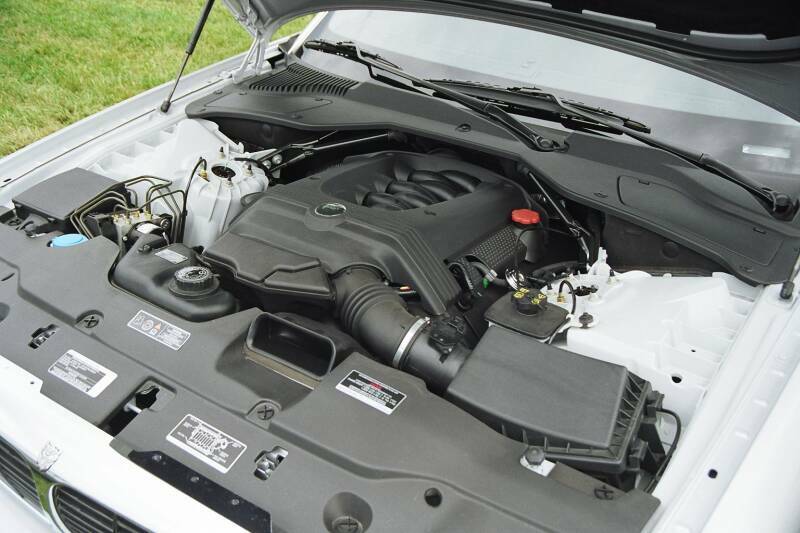 Jaguar engines have always been known to give plenty of torque even at low RPM and the new V8 is no exception with 303lb/ft at 4100 rpm for the normally aspirated version and a whopping 399 lb/ft at 3500 rpm for the supercharged. Little need to downshift before passing on the highway in the XJR, in fact when driving at speed in an R model it is often better to switch the transmission sports mode off and tap in all that torque without dowshifting. The big surprise came reaching the first corner where the big XJ suddenly felt like it had shrunk, shedding a few inches and a few hundred pounds. Interesting... The design of the 2004 XJ suspension is all new with the Self Leveling Air Suspension being the big news. Owners of older XJ40s might shiver at the idea of Self Leveling Suspension but the new system has nothing in common with the late 80s troublesome hydraulic system. A compressor mounted at the front of the car feeds an air tank at the rear; from there ride height sensors send data to the suspension ECU which in turns controls the spring/dampers units insuring an even ride height regardless of loading. For those driving in places where speed of 100mph can be sustained without fear for their license and insurance premiums, the system lowers the car by 3/4" above 100mph to reduce drag and improve stability. Jaguar's Computer Assisted Technology Suspension (CATS) is now standard across the range and adjusts damping according to road condition and driving style. Unfortunately, Jaguar still does not provide manual control of the settings, it's all left to the computer. 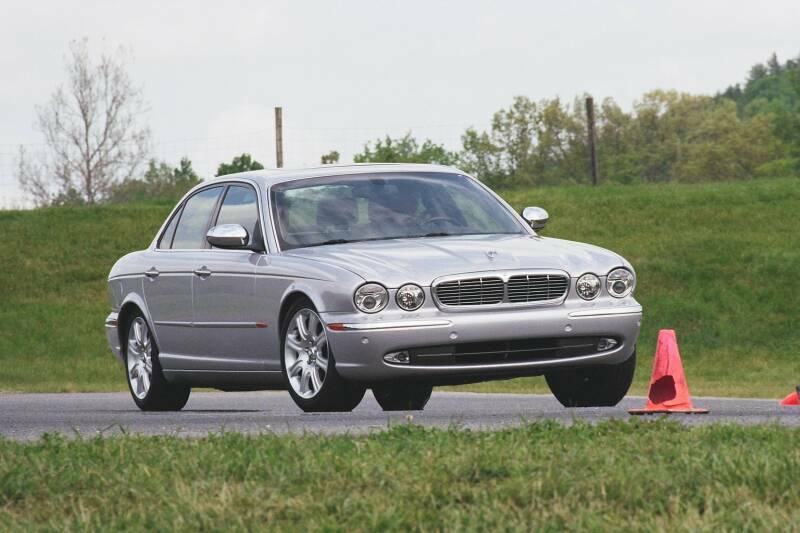 Finally, the programming of the speed sensitive steering also plays a role in how the XJ appears to miraculously shed pounds and inches. After accelerating out of a couple of corners, I noticed how the traction and stability control system had not gotten in the way of having fun. Stability kicked in a few times activating individual brake calipers but without killing the power; a huge improvement from the over aggressive traction control found in previous models where you won't have fun until you have hit the kill button on the dash. Very nice. Brakes are impressive, with standard Brembos on the supercharged model, a much needed improvement from the standard brakes fitted to previous generation of R models. Pedal feel is very close to the previous generation XJ, a bit soft which may surprise first time Jaguar drivers but which allows precise brake modulation. Amazingly, despite all the improvements, larger engine and better performance, the new XJ hits the show room at a price that is barely over 2003 model and still at least 13% below its main rivals from Audi or BMW. 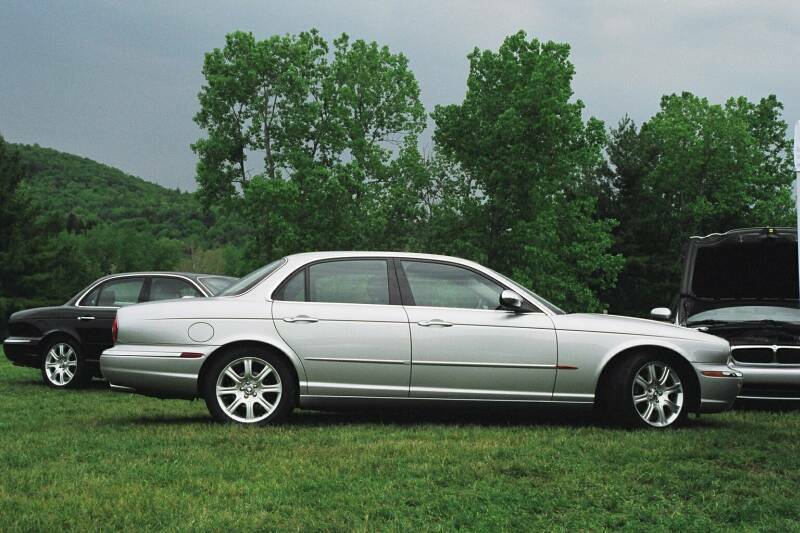 MSRP on the XJ8 starts at $59,995 with the Vanden Plas retailing at $ 68,995. If you want the "we have lift off" performance of the XJR, MSRP goes to $74,995. At this time, no supercharged Vanden Plas has been announced; as with all XJ sold in the US the base models are fully equipped and the option list is very short. In some markets where taxation and fuel cost are an issue like the UK and Europe, Jaguar is offering a 3.5 litre version of the V8 engine as well as an XJ6 model featuring a 3.0 litre V6. A diesel is also due out later on this year. yes... the new XJ is pure Jaguar, no doubt about it, and it raises the bar to new heights. After I test drove an S-Type R about a year ago, I noticed how the revised S was clearly a step above the then current XJR not just in comfort but also refinement and handling; suddenly the XJR showed its age... It was also an indication of things to come and now, a year later, the new XJ is indeed all we expected. Powerful, agile and stunning... Sir Williams Lyons would be proud.